Trash has changed in Tuttle! Republic Services has split Tuttle into 5 zones and each zone will have their own designated trash pickup day. 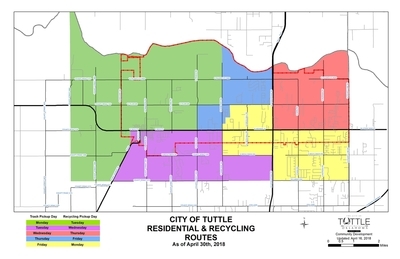 Click HERE for more information regarding Tuttle's Trash and Recycling Services, inlcuding our interactive trash zone map and text reminder service. Pre-registration for Area 1A is now closed. Registration for Areas 1A & 1B is now open. Please sign-up by clicking HERE. CLICK HERE to access information and to express interest regarding annexation into the City of Tuttle. You can follow us on Facebook at www.facebook.com/cityoftuttle and on Twitter @cityoftuttle. Please go HERE to register your controlled burns.